"This is perfect for kabobs! 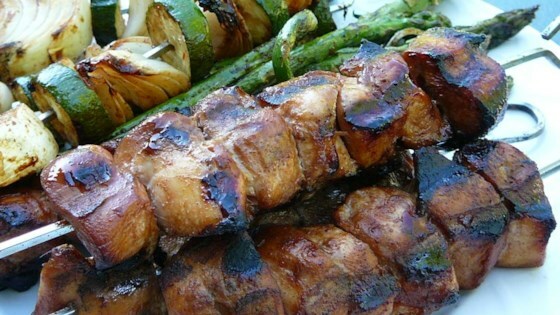 We generally use chicken or pork and it is great with onions, zucchini, and portobello mushrooms! You'll wow your crowd with this one! This is enough marinade for 2 pounds of meat and the veggies." Whisk honey, soy sauce, chili sauce, cumin, and vegetable oil together in a bowl. See how to make juicy grilled burgers loaded with good stuff. Reserve 1/3 of the marinade to baste with during grilling. Marinate meat for 1 to 2 hours. Delish!! I made as written, marinated chicken breasts about 5 hours, and grilled them. I served them with rice and snow peas. I used it on shrimp and veggie kabobs. I thought it was too sweet and I used less honey than the recipe called for. But, I really don't like sweet marinades. This was very easy and I used it on peppers & onions at a party. Everyone loved it! I would definitely make it again and use it for fajitas with chicken. Simple, easy and flavorful blend! Marinated chicken breast, sirloin, and veggies for approx. 6 hrs. Left proportions as is, but might add more chili sauce next time for added flavor. I think it's easy to over do it with the cumin, and next time I'll cut back on it, but otherwise this is quite good.